This Christmas season, join American Music Theatre in supporting one of our local food banks administered through Conestoga Valley Christian Community Services. Donated food items will help families who are struggling within our local community. AMT will be collecting non-perishable food items throughout the Christmas season, to benefit the CVCCS Food Bank program. When attending one of our Christmas Show performances this year, kindly consider bringing along a can or box to drop off in our collection container. CVCCS will pick up at AMT several times throughout the run of the Christmas Show. On December 24, these donated items will be included in boxes with turkey, bread, eggs, milk, and more, and distributed to families in need. – Canned green beans, carrots, peas, corn, lima beans, etc. 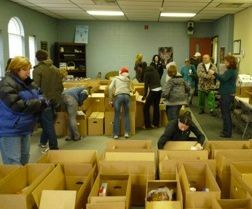 For more information on Conestoga Valley Christian Community Services, please visit cvccs.net. Thank you for helping AMT and CVCCS spread a little holiday cheer to appreciative families in our community.